This unique event will examine the options for preparing for catastrophic or near-catastrophic climate change. Attention will be drawn to the unavoidable consequences of anthropogenic greenhouse gas emissions that are already resident in the earth's atmosphere - or that will be in the near future - and on the various non-reversable feedbacks that are now being triggered (deep blue is the colour of the ice-free Arctic ocean when seen from space). The convention takes it as a given that global warming will have very serious impacts upon human civilisation. The discussion will not concern itself with emissions reductions or strategies for achieving these but will examine future global warming scenarios and the likely adaptations required at community level, particular in terms of food security. Ireland is very poorly prepared for climate change. It currently imports 62-68 percent of all food consumed and much of this food originates in countries that will be impacted upon negatively by climate change. The Irish agriculture sector, which is primarily focused on livestock production for the export market, imports 3 million tonnes of animal feed and 1.3 million tonnes of fertiliser every year. It is highly vulnerable to disruptions in global supply chains, including climate change impacts on the countries producing the animal feed. In terms of food security, it is absolutely essential that Ireland acquires the skills, knowledge and ability to produce much more of the food it requires. It is acknowledged that the countries in which female representation in political decision making processes is highest (for example the Nordic countries) are also the same countries that prioritise care for the environment. Conversely, the countries where the proportion of women in politics is lowest (for example the United States and Australia) are also the countries where climate change mitigation proposals are routinely obstructed by corporate and other vested interests. Are the alpha males who typically fill positions of power incapable of roles involving stewardship of the earth's resources or empathy with the wider biosphere? It certainly looks like it. According to Donald Trump, the president-elect of the United States and also the epitome of alpha male aggression, global warming is a 'hoax'. Meanwhile, back on planet Earth, 2016 is on course to be the warmest year in modern times, and carbon dioxide concentration in the atmosphere is at the highest level for millions of years. The convention sees the empowerment of women as a critical part of any climate change survival plan. The convention is aimed primarily at people who want to play an active role in helping their communities prepare for climate change. It is aimed at community activists, educators, planners, growers or intending growers and other people with an interest in food security. The event will comprise a number of practical workshops aimed at developing awareness of the type of problems human society will face. The workshops will be scenario based, problem-orientated and will be of a practical nature. Although some workshops will take place indoors, participants should come prepared for outdoor conditions and should bring boots and raingear. For logistical reasons the event will be limited to 36 participants. Fruit and Nut nursery was selected as the venue as it provides a working demonstration of what can be achieved with very minimal resources. In addition to being at the forefront of research into nut production in Ireland and the possible applications in terms of future food security, the nursery also has a growing expertise in sustainable land-management practices relevant to localised food production. Convention participants will have the opportunity to see some of the on-going work taking place at the nursery, including nut trialling, land rehabilitation and micro-climate modification. Opening Talk: What Do We Tell The Children? How do we explain that the world is on course for a 3.5-5C rise in temperature (with a significant risk of even higher temperatures) , with a potentially catastrophic outcome for our species? That the dangers of global warming from human-caused greenhouse gas emissions were acknowledged by the world as far back as the early 90s (for example the Rio de Janeiro Earth Summit in 1992) yet for decades nothing was done? That vested corporate interests created a bogus debate that their pet politicians then helped keep alive? That even the people who believed global warming was real were too caught up in their own lives, or just too powerless to effectively intervene? What exactly do we tell our children? That they'd better learn how to grow staple foods, build flood defences, and help develop community self-reliance for the day when the government can no longer be relied on to help? Or do we just pretend things will just continue as they are? It is the year 2052 and after decades of political inaction, prevarication and downright incompetence, the region is now facing major food shortages. As winter approaches, there are elections for the regional government. Against all predictions, the Radical party take the most seats. The radicals have no prior experience in government yet have to act quickly to address the growing food crisis. You are one of the new representatives. Along with the other members of the regional council, you have to put together a draft policy on food security for the next five years. Climate change brings with it all manner of unwelcome visitors: invasive plants that take over agricultural land, voracious insects that engulf crops, and devastating diseases. A new invader has recently been identified on a nearby farm. You are part of the task force charged with handling the threat. You are part of an inspection team visiting Fruit and Nut nursery. Your task is to evaluate the land rehabilitation and food security-related work carried out by the nursery and make proposals for converting the nursery into an educational institution. The team will then make proposals for reconfiguring the existing education system in order to prioritise global warming adaptation and food security. This final workshop will be run and organised by the workshop participants and will examine the options for taking forward into the wider community the ideas and empowerment concepts explored during the convention. How does a single person in a community gain attention? And on what things should they focus? We hope these questions will be answered. 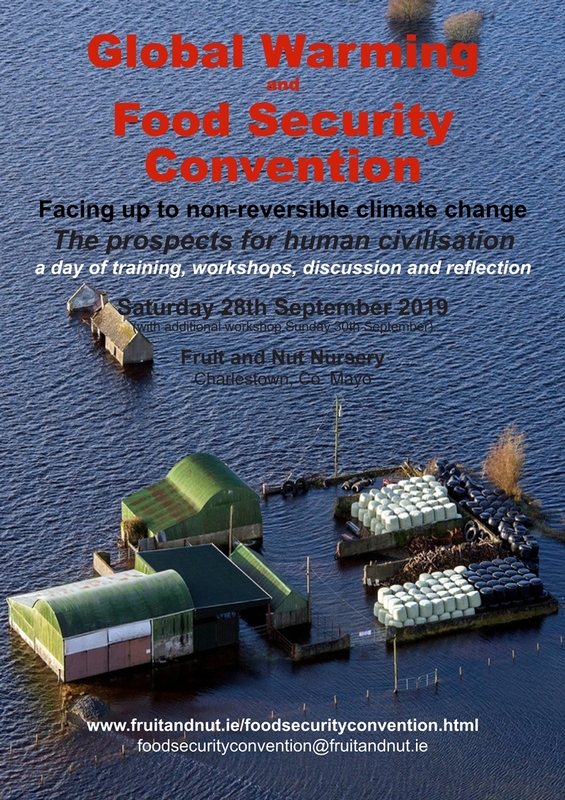 In time we hope many of the workshop participants (or their children) will become part of their local climate change/food security task forces. The convention is just the first step! Payment can also be made directly into our bank account. The IBAN should be entered as one continuous number (no gaps). If you are paying by electronic bank transfer please state your name in the space provided. This makes it easier for us to see who has paid. Anyone wishing to help in any way is requested to get in touch with the nursery. Current policies and plans for major countries and regions are, in aggregate, consistent with a medium to high emissions pathway, with emissions continuing to increase over the next few decades. The technological challenges to achieving a low emissions pathway are substantial, and are not being adequately addressed at present. Without an acceleration of innovation in energy technology and energy systems – including wind and solar with storage, nuclear, biofuel, petroleum-free passenger transport, carbon storage, and large-scale energy efficiency – the likelihood of following a pathway in which emissions fall rapidly and approach zero by late in the century is very low. High emissions pathways in which emissions continue to increase throughout the century cannot be ruled out, given the potential for extraction of large new coal reserves, as well as oil shale and methane hydrates. The climate responds to cumulative emissions, so any pathway that does not bring emissions close to zero will result in risk continually increasing over time. For any emissions pathway, a wide range of global temperature increases is possible. On all but the lowest emissions pathways, a rise of more than 2°C is likely in the latter half of this century. On a medium-high emissions pathway (RCP61), a rise of more than 4°C appears to be as likely as not by 2150. On the highest emissions pathway (RCP8.5), a rise of 7°C is a very low probability at the end of this century, but appears to become more likely than not during the course of the 22nd century. A rise of more than 10°C over the next few centuries cannot be ruled out. Humans have limited tolerance for heat stress. In the current climate, safe climatic conditions for work are already exceeded frequently for short periods in hot countries, and heat waves already cause fatalities. In future, climatic conditions could exceed potentially lethal limits of heat stress even for individuals resting in the shade. The probability of exposed individuals experiencing such conditions in a given year starts to become significant for a global temperature rise of around 5°C, and could exceed 50% for a global temperature rise of around 7°C, in hot areas such as northern India, southeastern China, and southeastern USA. Crops have limited tolerance for high temperatures. When critical thresholds are exceeded, yields may be drastically reduced. The probability of crossing such thresholds in a given year, for studied examples of maize in the Midwestern US and rice in southern China, appears to rise from near zero at present, to become increasingly significant with global temperature rise of more than 2°C, and in the worst cases to reach somewhere in the region of 25% (maize) and 75% (rice) respectively with global temperature rise of around 4-5°C.Biophysical limits on the extent to which such tolerance thresholds can be raised may be an important constraint on adaptation. This is one reason why high degrees of climate change could pose very large risks to global food security. With 1m of global sea level rise, the probability of what is now a ‘100-year flood event’ becomes about 40 times more likely in Shanghai, 200 times more likely in New York, and 1000 times more likely in Kolkata. Defences can be upgraded to maintain the probability of a flood at a constant level, but this will be expensive, and the losses from flooding will still increase, as the floods that do occur will have greater depth. Thresholds of adaptation beyond which ‘retreat’ from the sea may become more feasible than further increases in flood protection are not well defined, but the most significant limits may be sociopolitical rather than economic or technological. Climate models suggest that global sea level rise is unlikely to exceed 1m this century, and that a plausible worst-case scenario could result in an increase of several metres by the end of the 22nd century. However, due to inertia in the climate system, with a sustained global temperature rise of 2°C the global sea level may be committed to rise by some 10-15m as ice-sheets gradually melt, but whether this will take hundreds of years or thousands of years is deeply uncertain. Many elements of the climate system are capable of abrupt or irreversible change. Changes to monsoons or to ocean circulation patterns, die-back of tropical forests, and the release of carbon from permafrost or sub-sea methane hydrates could all cause large-scale disruption of the climate. The probabilities of such changes are not well known, but are they expected to increase as the global temperature rises. ...Consistent with their aversion to type I error and tolerance of type II error, climate scientists have often erred toward underestimating risk when faced with deep uncertainty. The basic premise of the convention is that Arctic sea ice melt represents a non-reversible tipping point in global climate change. Prior to the era of global warming, the part of the sea ice would melt each summer and reform again over the winter months. The month with the least ice is normally September. After this new ice begins to form. But in recent years the minimum area of summer sea ice has declined dramatically, from around 7 million km² at the start of the 1980s to only 3.39 million km² in 2012. This decline has been much more severe than even the most extreme of the IPCC climate change scenarios (which suggested the ice would only shrink to this area sometime between 2025 and 2050). If this general trend continues, which seems very likely, the central part of the Arctic ocean is likely to be ice free for the first time in tens or hundreds of thousands of years, sometime within the next ten years. The event itself (of an Arctic ocean free of ice) is not likely to represent the tipping point, but more a signal that the earth has already passed it. We say this because already, many significant changes are happening at the Arctic. The loss of sea ice is causing the albedo (relfectivity) of the Arctic ocean to change. Sea ice reflects upwards of 50 percent of incoming solar radiation back into space, while open water reflects only 5-10 percent. The additional ocean areas that are ice free in summmer are now warming rapidly which in turn is warming the polar atmosphere, leading to increased ice cap melt over Greenland as well as the warming of the permafrost regions of northern latitudes. Permafrost melt is releasing more carbon dioxide and methane (the principal greenhouse gases) into the atmosphere, adding to the potential for further global warming. And so the cycle continues. But more frightening still is the spectre of methane hydrate melt. The methane hydrates are deposits of methane in frozen sediments situated under the seabed of the East Siberian Shelf. Normally the sea is cold enough to maintain these sediments in a frozen state (the freezing point of sea water is -2C). But now the sea is warming, the deposits of methane are being released. All told, the deposits hold hundreds of times more methane than is currently in the atmosphere. Methane is a very powerful greenhouse gas, with 28-84 times the global warming potential of carbon dioxide. Although the sea ice area in September of 2016 was not a record low, the rate of ice recovery since then has been markedly slow. 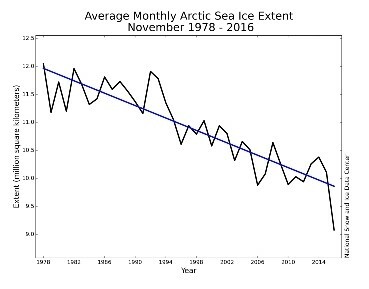 As a result, the ice area in November 2016 established a new record low for that month (see graph). We think that it is possible that the earth has already passed the tipping point. For more information on what is happening at the Arctic as a result of sea ice melt, see this short interview with Dr Natalia Shakhova, one of the world's leading authorities on polar methane hydrate emissions. Dr Shakhova has spent the last decade carrying out research at the East Siberian Shelf, where vast quantities of ancient methane are trapped within and below frozen sediments. These sediments are now melting, releasing the methane into the atmosphere. If only 1 percent of the methane escapes, it will double global atmospheric methane levels. Here Dr Shakhova discusses the inevitability of this event, and the likely timescale.